Would you like to buy a new vehicle? Most probably your answer will be "Yes, I am". ok.. Next question which one you like to buy(Leave you financial situation here, say your dream)? Low cost Tata Nano? jaguar? Opel? Ferrari? Benz? Toyota? BMW? Of course the list is very long. In the case of motor bike it may be from Hero Honda, Honda, Bajaj, Yamaha, Harly Davisson, Susuki etc. But what about a bicycle? Would you like to buy it? Some will say bicycles are for childs, or it may not be a good fit for your ego(I know you will not say the word ego!!!). You may not like to travel in a bicycle through the great Indian Roads etc. Of course after thinking about roads some may fear that how he was even able to think about traveling in a cycle. Even the cars doesn't give any safety to life how a bicycle can? Heavy rains, pot holes in roads, heavy traffic(high speed vehicles - which doesn't follow any traffic rules) all may be against the idea. But if you ask me, my answer will always be a yes. I like to travel in bicycle. And in many countries people like to use their legs(to pedal the cycle) more often than oil. 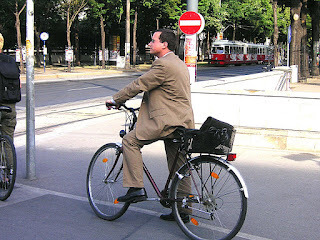 If we consider the entire world bicycle may be the second most common commuter method only after walking. Its highly popular in India and China. After the fancy about oil powered vehicles, world is again started to like cycling. A survey estimates that across Germany there may be 4mn bike commuters, and 9% of all journeys are through cycles. The percentage is 27 in Netherlands and 18 in Denmark. Another astonishing fact is that in Berlin the number of bicycle commuters doubled in past 10 years, and 13% of all trips are made through cycles - the rise in cycle users may be due to deteriorating rail traffic, high petrol prices, or the concerns about climate change. whatever it may be the result is good. And mixed commuting too is very popular in many European countries. This aerobic exercise is also proved good to reduce the symptoms of depression, to reduce obesity, it also reduce the risk of heart diseases. It have economical and climate advantages too. But the other part is the inability to a) travel long distances(practically), b) to attain high speed, c) difficulty in carrying huge loads and d) low security - The risk of theft is high. The other problem is sweting and body odor - It may not be a problem at the time of excercise but on the way to office it will be. Taking a shower is may reduce the problem. If it may feel difficult you can use microfiber travel towel, wearing wool of synthetic wicking fabric etc. The other problem is exposure to pollution in roads. According to a study conducted in Sydney (Please see the table) shows that cyclists are exposed to less pollution(benzene, toluene, ethyl benzene, xylenes and NO2) than occupants of a car. (of course the pollution level is much less in train). "Car commuters received the highest average exposure to benzene, toluene, ethylbenzene and xylene of any of the commuting modes. Bus commuters had the highest average exposure levels to NO2. Train commuters recorded the lowest exposure levels for all four BTEX pollutants and NO2. Walking and cycling commuters had significantly lower levels of exposure to benzene compared with car commuters and significantly lower levels of NO2 than bus commuters." So buy a cycle and keep yourself fit.